Oh man, I mentioned before that our freezer leaked. Well, it leaked more than we realized. 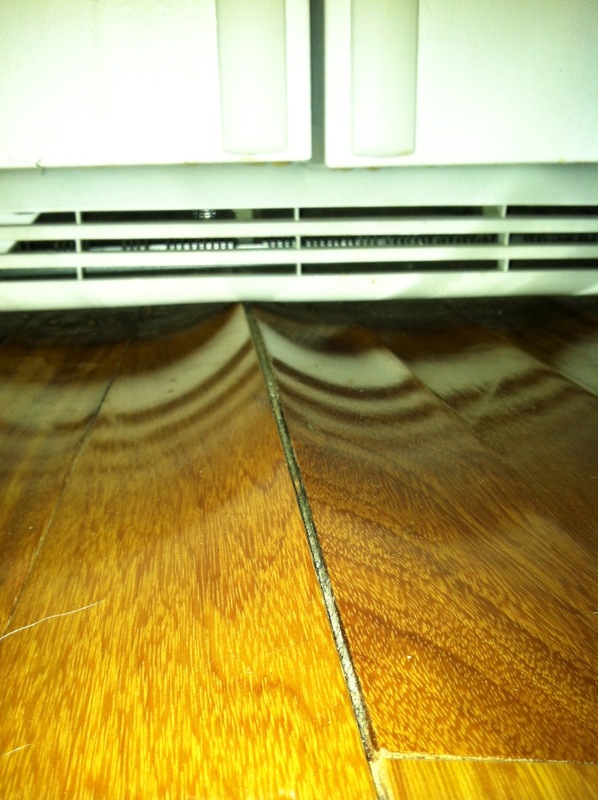 So much so that our hardwood floors are buckling just beneath our fridge and it’s starting to spread. I did what we were supposed to. I put towels down to soak up the moisture underneath and I ran a fan towards the source for days. As soon as I turned the fan off and just started to forget about the leak, a mountain started forming in our kitchen. There’s no way to miss it unless it’s 7:30AM and you haven’t had your coffee yet. Yes, my husband and I have tripped on Mt. McNeer on more than one occasion. We contacted our trustworthy home warranty company and set up repair for the refrigerator. They came out in no time and solved the problem. Little did we know we’d be slowly growing new hill in our kitchen. Our favorite floor people came out to check out the damage. The job is too small for the big guys to do it, so an independent contractor is coming in to shave the hill top tomorrow. We’re hopeful it will look like new after everything is fixed. The lesson here is to keep an eye on your fridge. They have a mind of their own. Oh, my!!! This would keep me up at night. It seems you're kind of taking it in stride. Right? You should see what it looks like now! Ouch! 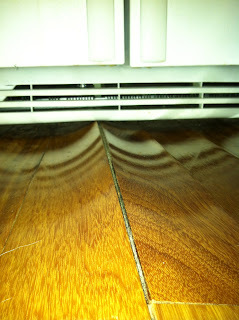 Always wanted hardwood in my kitchen, but was afraid to do it because of something like this. But it just looks so gorgeous! Hope it's on the mend now! Oh Nooooooo!!!! That's the main reason we'll never put wood in our kitchen. We were thinking about doing a laminate, b/c then I wouldn't be so upset if we had any leaks. . . . it's just laminate. I hope you get it taken care of soon! And hope the refrigerator behaves better for you!! Hardwood floors look beautiful in homes. Too bad it happened in the kitchen, hopefully repairs are not too expensive. OH NO!!!! I have always loved hardwood but been too afraid to have it in the kitchen for just this reason. Yikes! I can't even tell you how worried I am that this will happen to us. I only hope if it *does* happen, it's before our home warranty runs out! Oh my word,in our other house, we has hardwood in the dining room, and upstairs in the hallway. But the builder did say dont get hardwood in the kitchen, because of water damage, I am glad you can get it fixed! Aw...that really stinks. I hope the repair costs are covered by insurance or minimal at best. Hoping your new floor is flat as the prairie lands (the kitchen is no place for mountains! ).